It started in Chennai – in the south east. 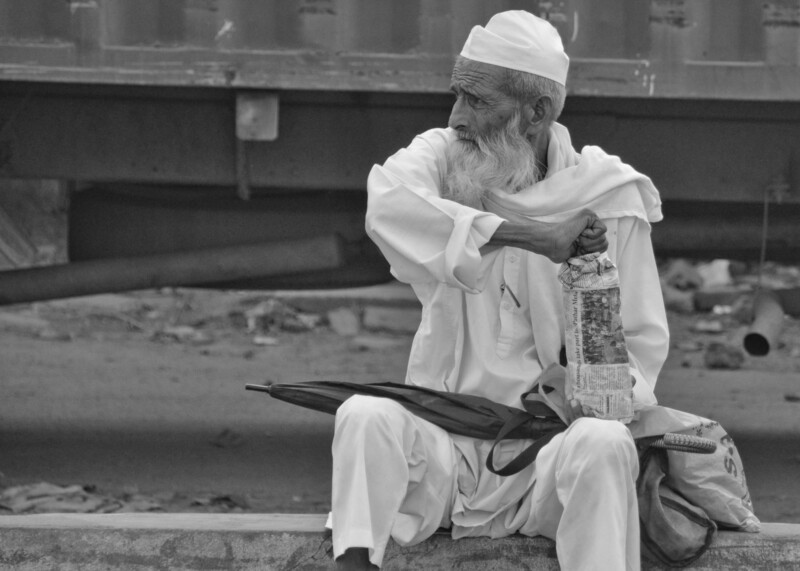 Bill and I explored northern India 4 years ago and wanted to see the South. Preston and Chloe (eldest son and daughter-in-law) decided to join us. UNESCO World Heritage sites are always on the radar. On the Coromandel Coast in the Bay of Bengal, Tamil Nadu – the Monuments at Mahabalipuram were a great place to start. The rock carvings were founded by the Pallava kings in the 7th and 8th centuries. The terrain consists of larger than life sized boulders right next to the coastline. Our original plan was to take the train to travel across the country – opting for overnight sleepers when possible. We got to the station at 10 pm for a midnight train. It was already delayed by two hours. We suspected that as the clock approached 2 am it would be further delayed – most trains were. Everyone was very tired. Sleeping on the floor is obviously okay, but when Bill saw the sign that read “please do not defecate on the station floor” we decided to return to the hotel, get some sleep and fly. Onward to Kochi in Kerala. An overnight 2 bedroom houseboat trip through the backwaters in Alleppey. We kicked back on the huge lounge at the front of the boat , drank beers and cruised at a snails pace – watching life on the water. Fishing, bathing, washing clothes/dishes, taxi boats and children bobbing in the water are part of life on the banks of the waterway. We stopped at a tiny fish market and picked out humongous jumbo prawns for dinner. Freshly cooked lunch, dinner and breakfast fit for an army was served to just the four of us. We strolled along the coastline in Kochi and got a lesson on the workings of the famous Chinese fishing nets. It wasn’t fishing season but the Portuguese contraptions make for good stories. Yes, Chinese fishing nets. Nets from China – the idea from the Portuguese. China won on the name game. Goa – oh Goa. You are so clean. India is known for it’s garage. It’s everywhere! For some inexplicable reason the beach in Goa is CLEAN! We stayed at Utorda Beach area and did I tell you it was clean? We strolled the white sandy beach, splashed in the warm clean water and relished the peace. Goa is home to a series of UNESCO churches built by the Portuguese in the early 1500’s. They are stunning and attract lots of visitors. The Christian population in Goa is around 25%. High for a country that is mostly Hindu. We witnessed a Hindu ceremony at the Shanta Durga Temple. Not sure what it all meant but it was special none the less. A seaside dinner was off the charts. Water front dining with nothing but candle light. The menu – a bucket of fresh fish delivered to your table. Mumbai – large, crowded, dirty and has crazy traffic which all comes to a screeching halt at 2 in the afternoon when the 6 hour traffic jam starts. We packed a lot into a couple of days. Highlights were the Haji Ali Dargah Mosque, on an inlet and quite the landmark, constructed in 1431. Mani Bhavan – Gandhi’s headquarters for approx.17 years, from 1917 to 1934. My personal fav- Ghobi Ghat, an open air laundromat without machinery, washing the clothes/bedding from Mumbai’s hotels and hospitals. It’s fascinating. Gateway to India, erected to commemorate the landing of King George V and Queen Mary in 1911. Elephanta Caves, another UNESCO World Heritage Site, is a series of caves dedicated to Shiva dating back to 550 AD. Lunch at Leopolds (read the book Shantaram) (it still has dozens of bullet holes from the 2008 terrorist attack) and lastly shoulder to shoulder bazaar shopping at Linking Road. Phew… It was a remarkable trip and wonderful to be able to share it with the kids. This entry was posted in India and tagged Alleppey, Chennai, Goa, Hindu, India, Kerala, Kochi, Mumbai, Photography, Travel, Unesco, World Heritage, World Travel on November 10, 2017 by Bill and Paige. This entry was posted in India, Photo of the Day 2014 and tagged Photo of the Day, Photography, Travel on July 14, 2014 by Bill and Paige. Painted Elephant in Jaipur, India. 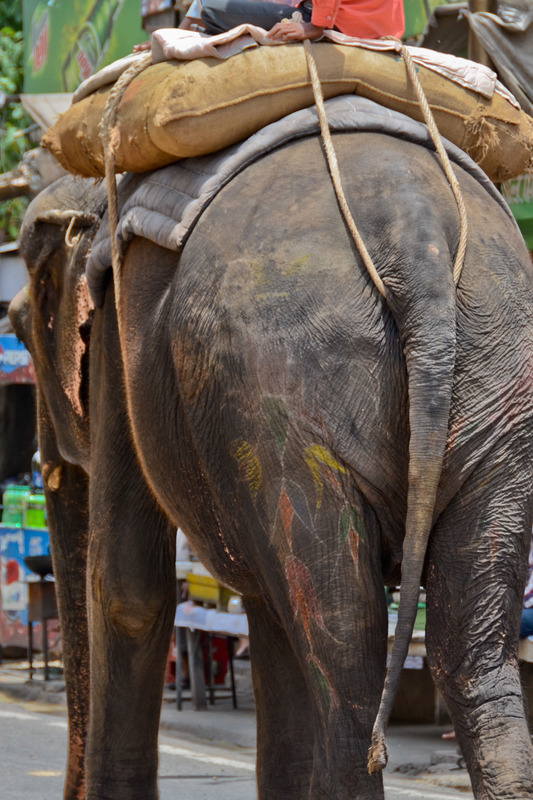 This entry was posted in India, Photo of the Day 2014 and tagged Jaipur, Painted Elephant, Photo of the Day, Photography, Travel on July 13, 2014 by Bill and Paige. 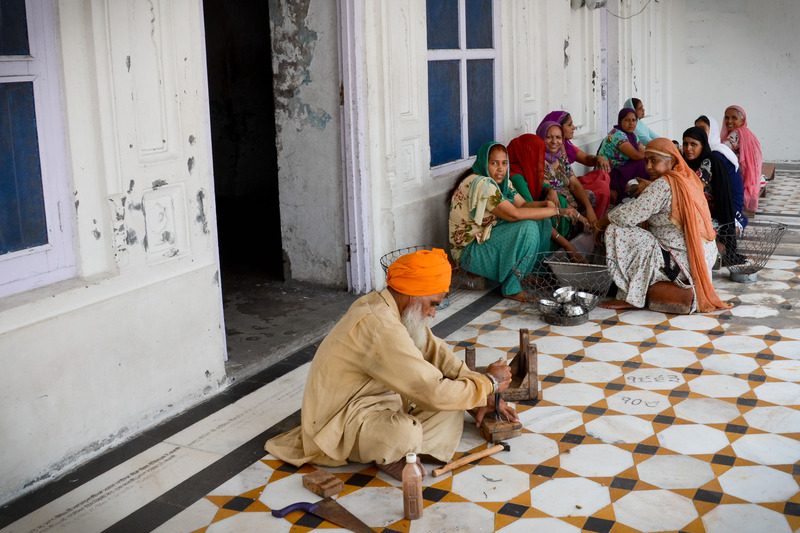 Working away at the Golden Temple in Amritsar, India. Upwards of 100,000 free meals are served here daily. There is an incredible sense of community in holiest shrine of the Sikh religion and the world’s largest free kitchen. Volunteerism is key – whether fixing a stool or cleaning bowls. I sat down with a similar group of ladies and partook in bowl cleaning. Perched on tiny stools, we rubbed some sort of sandy dirt around the surface of the bowls with our bare hands. This entry was posted in India, Photo of the Day 2014 and tagged Amritsar, Golden Temple, Photo of the Day, Photography, Travel on July 12, 2014 by Bill and Paige. As a child – when I closed my eyes and thought of India…..
My visions came true at the Amber Palace in Jaipur, Rajasthan. 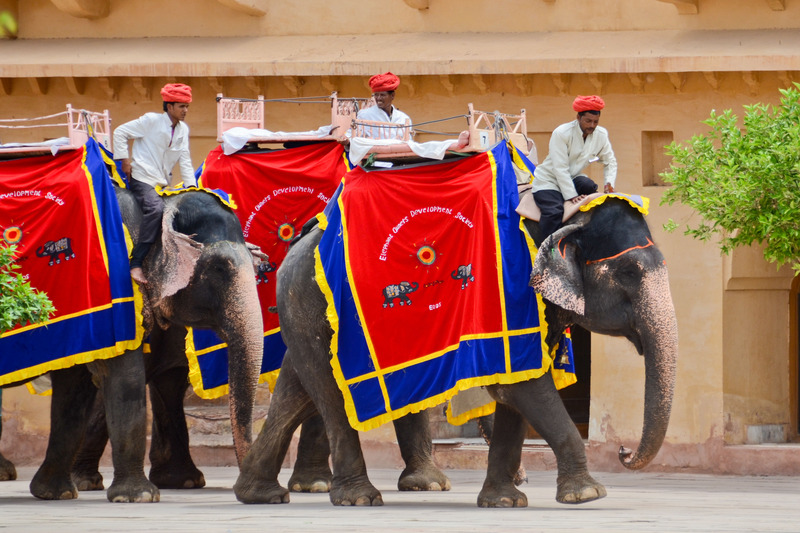 This entry was posted in India, Photo of the Day 2014 and tagged Amber Palace, Elephants, Jaipur, Photo of the Day, Photography, Travel on July 11, 2014 by Bill and Paige. 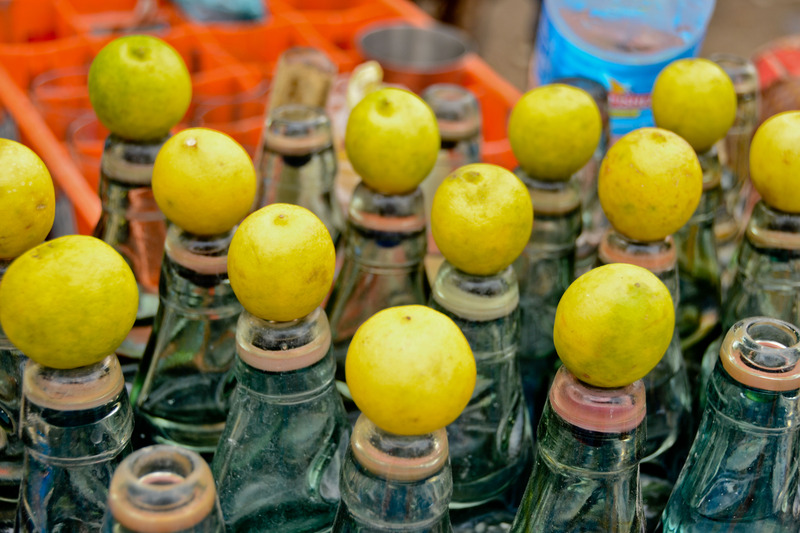 Lime drink at the Pakistan – India border where we went to seeing the changing of the guards. This entry was posted in India, Photo of the Day 2014 and tagged Changing of the Guards, India Pakistan Border, Photo of the Day, Photography, Travel on July 8, 2014 by Bill and Paige.